After our debut Webcast on Saturday 16th March (click here to go to archived video) We’ve had lots of questions about the new features and what is the best version to buy. I’ll break down the key features and provide some ideas of how/why you would use them. ▪ It comes in three editions: Intro, Standard and Suite. ▪ Standard and Suite have additional features, Instruments, Packs and Effects. ▪ Intro is exceptional value and a great introduction to Ableton’s main features. ▪ Suite is aimed at the producer who needs a wealth of sounds and virtual instruments. All of the versions have the unique Session View for quick, intuitive composition, flexible performance and improvisation. This is the screen that can be used for Djing and Live performance. ▪ WAV, AIFF, MP3, Ogg Vorbis, FLAC file support. • Sampler – virtual sampling instrument with multisample playback and sound design. • Corpus – simulates the acoustic properties of resonant objects such as pipes, membranes and tubes. These features alone help to justify the price difference, they are powerful audio tools that help you to create manipulate pretty much any sound. I must admit that at first glance they don’t ‘look’ impressive, but that is part of the whole concept of Live, its what goes on ‘under the hood’. These instruments don’t place too much demand on your processor, graphically they are minimalistic but use your ears and you will be kindly rewarded! In the web cast (link at the top) I demonstrated the use of the new Audio to Midi features; these are exclusive to Standard and Suite. Anyone who has used or seen these features will know how incredibly useful they are. Other workstations do have this functionality but it’s not as accessible as it is in Live. Having this feature allows you infinite possibilities for sound sources and grooves. Too many to go into here perhaps! One idea would be to use your voice as a sound source, imagine beat boxing the rhythm track, singing the bass-line and melody and then layering tones to make complete chords? This is surely a great feature that many existing users are very pleased to see included. Sample-based artists can use the groove or melodic/harmonic content from any recording this allows you to re-invent your entire sample library. So why buy Ableton Live Intro then? At £79.00 what do you actually get? Well surprisingly still a great deal! Intro is a great title for this product as this is exactly what it is. • Sample warping is included, Ableton analyses each sample allowing you to change the tempo of the song in real time and all the samples will follow with out changing pitch. This is a very fast way to experiment with material from different genres/tempos and have no restrictions. 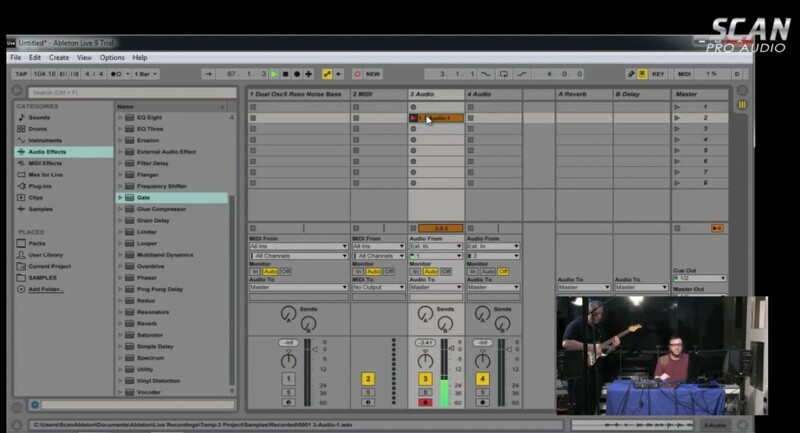 • Re-Wire is included – So if you cant pull yourself away from Cubase,Reason,Logic or whatever you use, then Ableton will happily run alongside any of these programs in Slave or Master mode. Many producers use their plug-ins from Cubase or Logic but run Ableton alongside for its excellent audio and MIDI tools. If you want to harness the full power of Ableton Live, then Suite is definitely the one for you, with over 3,000 sounds you can use all of the instruments, packs and effects and have a fully functional studio package. If you don’t need all of the extra plugins and effects then Standard does have most of the technical features such as Audio to Midi, unlimited tracks etc. This is probably a good choice if you already have a good collection of 3rd party plug-ins or a vast sample library. Intro is best for beginners or those already loyal to another DAW, the good thing here is that you can always upgrade and unlock the other features when you are ready. Hope that makes things a little clearer! Look out for more Ableton Live 9 videos soon on the Scan Pro Audio You Tube channel. Previous PostScan Pro Audio Webcast: What did you miss?Next PostWin Focusrite, Novation & KRK Gear In The 50 Days Of Spring Give Away.